Kınık is a town in Lycia, administratively in the southwestern extremity of Antalya Province, Turkey. 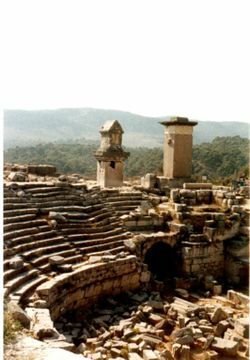 It's mostly visited because of its proximity to Lycian sites of Xanthos and Letoon, both of which are in the UNESCO World Heritage List since 1988. Kınık is an inland town on one of the rather rare coastal plains along this part of Mediterranean coast. The main livelihood for the local people is vegetables (mainly tomatoes) produced in the greenhouses surrounding the town—indeed, Kınık is one of the places with the highest concentration of greenhouses in anywhere in Turkey and you will not be able to see an inch of soil not covered by plastics around the town when looking below from a nearby higher hilltop. Batı Antalya  provides bus service to Kınık from Fethiye in the west and Kalkan, Kaş, Demre, Finike, Kumluca, Olympos, Kemer, Antalya in the east. Kınık lies close to (about 1 km away) main Fethiye-Kaş-Antalya highway (D400). The next large-ish town to east, Kalkan, is about 19 km from Kınık. Lycian Way, a waymarked hiking trail along the Lycian coast (though usually a few hundred metres above the actual coastline, through the mountains with gorgeous views), traverses the town and connects it with several towns, villages, and ancient ruins in the surrounding region. Xanthos lies 1 km away from the town, while Letoon is 4 km away. Lycian Way, recognizable by its distinctive yellow-black signs, links both to the town centre. Walking from town centre to Xanthos takes about 15-20 minutes. An old guy with a somewhat dilapidated Mercedes seemingly approaches anyone apparently a traveller (carrying a large backpack for example), offering ride to Patara, about 10 km away. One day in July 2009, in downtown Kınık, he approached a backpacker, when his fellow backpacker was away, and asked whether he would like a ride to Patara for 20 TL. His offer was refused by the backpacker. Later in the same day, in Xanthos this time, he approached the other backpacker. However, this time the price went down to 10 TL, half of what was asked for initially. His offer was declined once more, and when told that the backpackers preferred to hitchhike, he said it was real hard to hitchhike out of town and the travellers would waste too much time waiting beside the road, which, of course, was not the case. All in all, it's up to you to decide whether to take a ride with this guy or not. However, if you decide to go with him, be ready to haggle heavily and never ever pay more than 10 TL total. There is a post-office (PTT) in town centre. The telephone code of Kınık is (+90) 242. Patara, one of the longest stretches of sandy beach anywhere in the Mediterranean basin, with some Lycian and Roman ruins behind the shore, lies some 10 or so km to the south of Kınık. This page was last edited on 20 June 2011, at 21:32.